Claudio Ranieri says his table-topping Leicester City team are enjoying a "magical season" and can handle the pressure of the title run-in. The Foxes moved seven points clear of Tottenham with six games remaining thanks to a 1-0 win over Southampton. "I am very calm," said Ranieri. "We believe in what we are doing." He said "everybody" was waiting to see how they would react to Tottenham's 1-1 draw with Liverpool, adding: "We gave a very good answer." Leicester need 12 points from their final six games to become champions. Ranieri said his squad know they may not get another shot at glory. "We try to do our best. Other teams can win 3-0, 4-0. We have to fight to win 1-0. We must be focused in our way." On this day a year ago, Leicester were bottom of the Premier League and seven points from safety, having lost 4-3 at Tottenham. 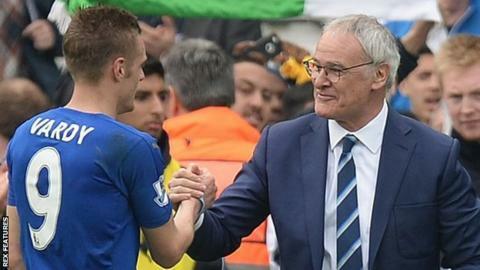 Striker Jamie Vardy had scored only once in six months and the Foxes has lost 18 out of 29 league games. Leicester have played 41 Premier League games since - winning 27, drawing 10 and losing just four to complete a remarkable turnaround in fortune. Leicester owner and chairman Vichai Srivaddhanaprabha travelled from his native Thailand to watch the win over Southampton on the eve of his birthday. To celebrate his big day and thank Leicester's fans for their support, the club gave away a free doughnut and bottle of beer to every ticket holder. "We sung 'Happy Birthday' to him in the dressing room before the match and I asked the players to give him a good present, three points," said Ranieri. Srivaddhanaprabha and his party flew off the King Power Stadium in a helicopter after the final whistle - but not before making sure a box of doughnuts was on board.